A partnership of 98 between Bradley Parry and Conor Boyd laid the foundation for Academy’s win against Saintfield with five wickets to spare. 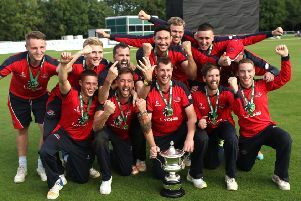 Parry’s 74 included 12 boundaries, three of which cleared the rope, while young Boyd, who recently captained Belfast Royal Academy to victory in the Schools’ Cup final, had two boundaries in his 32. Rain delayed the start at Castle Grounds on Sunday afternoon in a Senior League Section 1 fixture that was reduced to 39 overs a side, and having been put in by skipper Matthew Palmer, Saintfield were restricted to 161 for 6. Harte was the most successful bowler with 3-35, with good support from Stephen Sistern-Tate (2-16), while wicket-keeper Parry was responsible for the run-out. In reply, the hosts got off to a stuttering start, with Palmer and Mark Shields back in the pavilion with 32 on the board. Then followed that match-winning third-wicket partnership between Parry and Boyd that advanced the score to 130 for 4, en route to a total of 162 for 5 in 35.0 overs. The win leaves ACC in mid table with 12 points from four outings, but with four games in hand they could catch leaders Downpatrick, each having lost only once, while at the opposite end Saintfield still await their first points following seven straight defeats.